ADA Dentist and Student Lobby Day kicks off in D.C. Dental students: Spencer Tepe, fourth-year dental student at the Ohio State University, and (left) Larisa Flores, second year dental student from Temple University, were among the dental students to ask questions during the How to Meet with Your Member of Congress session. Washington — Assign roles. Develop your talking points. Share personal stories. 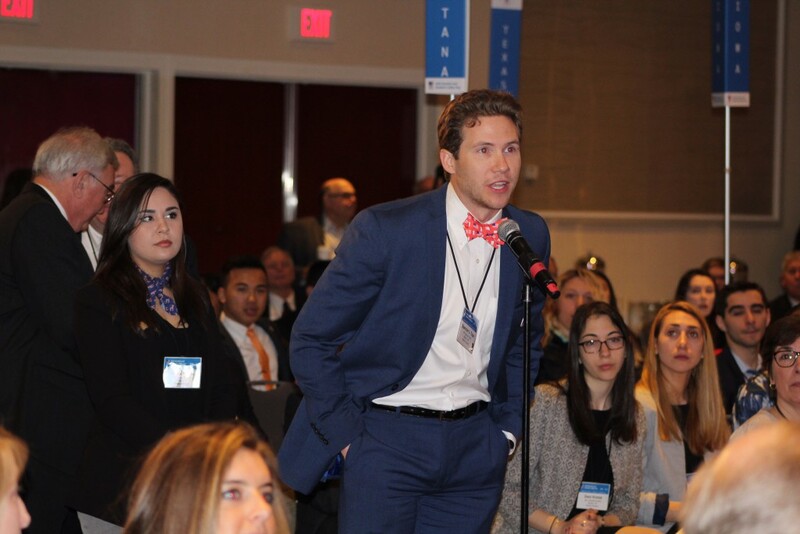 In an effort to educate members of Congress on the importance of three dental and health care-related proposals, hundreds gathered for a March 27 morning session to kick off the ADA Dentist and Student Lobby Day. This is the first year the ADA is holding its annual advocacy conference in conjunction with the American Student Dental Association’s lobbying event. Formerly known as the ADA Washington Leadership Conference, the ADA Dentist and Student Lobby Day is hosting some 1,000 dentists, dental students, state association staff and other dental leaders in the nation’s capital. Practice makes perfect: During a role-playing event during the March 27 ADA Dentist and Student Lobby Day, panelists pretend to be constituents. 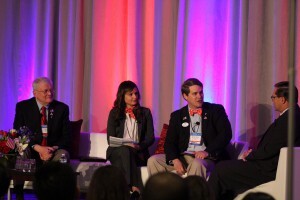 Dr. Charlie McGinty, left, a former chair of the American Dental Political Action Committee; Sara Golkari, of Tufts University School of Dental Medicine; and Dr. Justin Norbo, of the New Dentist Committee play constituents as Michael Graham, right, ADA senior vice president, Government and Public Affairs, fills in as a congressional representative. The March 26-28 event is expected to be the largest and most successful advocacy event for any health care association in 2017, organizers said. 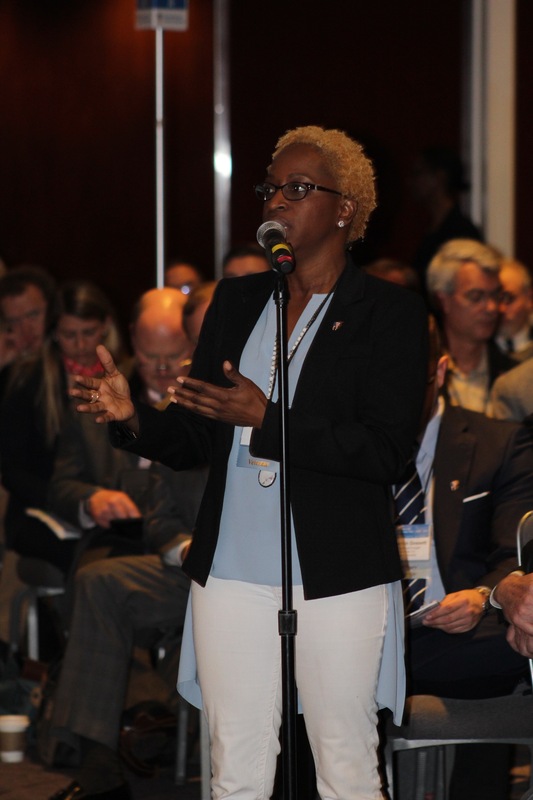 During their visits to Capitol Hill, attendees will meet with members of Congress and their staffs and speak out on three issues important to the oral health profession and patients: repeal of the McCarran-Ferguson antitrust exemption, student loan and debt issues and health care reform. But first, attendees gathered for the How to Meet with Your Member of Congress session on March 27. Those attending, seated to look like a national political party convention, received some tips and advice from Dr. Charlie McGinty, former ADPAC chair; Dr. Justin Norbo, New Dentist Committee member; and Sara Golkari, of the ASDA Council on Advocacy. The three role-played as constituents meeting with their representative to advocate for several issues. Before meeting with their representative or senator, groups whose members are from specific states and districts were encouraged to assign roles, such as who will do the introductions, which member will speak for each issue and who will do the closing. They were advised to focus on the top three points they want the member of Congress to remember about the legislation being discussed. This included sharing stories on how a particular law or bill has personally affected the student or member dentist. Question: Dr. Cathy Cook, of Georgia, asks a question March 27 during the How to Meet with Your Member of Congress session of the ADA Dentist and Student Lobby Day event in Washington, D.C.
Organizers said telling a story about the effects that legislation or an issue has on a constituent or district has a greater impact than facts and figures on the position of a member of Congress. “In 2016, the average educational debt per graduating dental school senior was over $262,000. I myself am carrying $400,000,” said Ms. Golkari, during the role play. “Now, I know $400,000 may not seem a lot,” Ms. Golkari said, prompting laughter from the audience. However, with interest rates, that amount can only grow, she added. Most dental students rely on federal student loans to finance their dental education. While the interest rates and repayment terms for federal student loans are generally more favorable than private sector loans, the borrowing terms can still be daunting, according to the ADA. Ensure people have access to oral health services when considering reforms to Medicaid and the Affordable Care Act. Continue their support of H.R. 372, The Competitive Health Insurance Reform Act, which would amend the McCarran-Ferguson Act’s antitrust exemption and which overwhelmingly passed the House of Representatives on March 22. Belen Diaz, first-year student at the University of Texas School of Dentistry, is also advocating for Congress to address the issue of student loans. Ms. Diaz is scheduled to meet with the staff of Rep. Beto O’Rourke, D-Texas, and Sen. Ted Cruz, R-Texas. Along with reminding attendees how to interact with their members of Congress during their meetings, the morning session also advised them on another important matter: what not to say. These include avoiding conversations on topics not related to the legislative issue under discussion, partisan politics and political activities or fundraisers. The goal of the session legislators and their staff hear on point messages from both dental students and ADA members. Follow all of the Lobby Day activities on social media using the conference’s official hashtag #ToothParty. Stay tuned to ADA News for continuing coverage of Lobby Day. Great gesture to give a chance to new dentist or students to showcase their talent. Since such events are needed to get them out of their monotonous life, whereby they can also feel socially active among all.